Recognized schools are all required to demonstrate either advanced or exemplary practices in the two primary criteria. Gold schools must demonstrate either advanced or exemplary practices on a total of at least five criteria, of which at least three must be exemplary. Silver schools must demonstrate either advanced or exemplary practices on a total of at least four criteria, of which at least two must be exemplary. At the most basic level, a School of Opportunity must strive to ensure that all students have access to rich, challenging and supported opportunities to learn. This means that the school’s best opportunities cannot be exclusive or rationed. 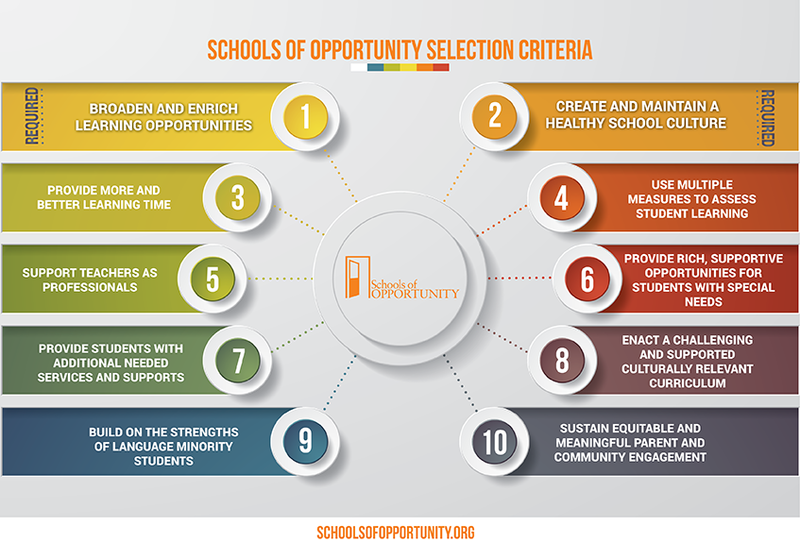 For this reason, we will recognize a school as a “School of Opportunity” only if it declines to restrict or stratify student access to those best opportunities. In addition, we seek to highlight schools with strong and welcoming cultures, therefore we will only recognize schools if they reject “zero tolerance” policies and other discipline policies that unnecessarily exclude students from opportunities to learn. Accordingly, all applicants need to address the first two practices, Criterion 1 and 2. Then applicants may choose which four of the remaining eight criteria they wish to highlight in their application. Criterion 1 (a). Does the curriculum include a range of subjects, activities and experiences that provide a full, high-quality education? Is it designed with the particular needs of the students in mind? Research shows that having a rich and diverse array of subjects, including social studies, science, art, music and physical education, and other interesting electives available throughout the school year improves student learning and academic success. Do students at this school have access to broad and meaningful learning experiences? Criterion 1 (b). Research also shows that de-tracking reforms help increase student access to challenging curricular materials and high-quality instruction. Has the school taken steps toward universal access to accelerated and supported learning opportunities? Do all students have access to honors, IB and AP courses? Has the school abolished low-track classes with low expectations? To what extent do all groups of students participate in college counseling programs and in PSATs, SATs, and ACTs? Course guide and 2016-2017 master schedule that lists course names and sections. Please also include any flowcharts that explain course progressions. Evidence that the school has eliminated low‐track classes and, more generally, evidence of the steps the school has taken to increase the access of students to challenging curricular materials and high-quality instruction (e.g., letters sent to parents and regular outreach by teachers or counselors). Evidence that all students have access to accelerated and supported learning opportunities and communications to students inviting participation. Evidence of a high rate of inclusion of low-SES students and students of color in honors, AP and IB classes and, more generally, evidence of course enrollment by sub-population. Criterion 2 (a). Schools where students feel oppressed or face bullying, harassment or discrimination also hamper students’ ability to learn. Has the school taken steps to create a safe, welcoming school environment for all students, including students from all racial, ethnic and religious groups, genders and sexual orientations? To what extent has the school developed clear plans to proactively include the culture and identity of all students on campus and in the curriculum? How does the school prevent discrimination for different sub-populations, and how does it equitably and effectively resolve bullying or discrimination when it occurs? What national or local resources and curriculum does the school use to support the academic, social and emotional well-being of students? How does the school include parents as partners in the development of school culture? Criterion 2 (b). A critical component of creating a healthy school culture is having a positive, restorative and non-exclusionary approach to school discipline. Students cannot access rich learning opportunities when they are excluded from school through suspensions, expulsions, and similar approaches to discipline. While suspensions are sometimes necessary and appropriate, these policies are particularly troubling when they disproportionally exclude students of color, special education students or lower-SES students. What does this school do to ensure that student discipline is approached equitably? Is as non-exclusionary as possible? Does the school have an active and successful plan to help students learn positive behavior and maintain self‐control? Does the school provide learning resources for suspended students so that they do not fall behind? Do suspended students and their families understand their rights and obligations, and do they have knowledge of and access to a clear appeal process? Code of Conduct; Documentation of Positive, Restorative and Non-Exclusionary Discipline Plan; Evidence of equal implementation of school discipline across student sub-groups; Evidence of learning resources for suspended students. Statements of Inclusivity for All Students; Evidence of programs described; Evidence of community partnerships to address school climate; Document that informs parents of right to appeal discipline decisions. While higher-income students receive expanded learning opportunities (such as music lessons, museum visits, or hands-on science or social studies experiences) at school, afterschool and in the summers, lower-income students disproportionately lack such opportunities. These enrichment opportunities engage students in learning and help prepare them to succeed in college, in work and as participants in our democracy. Has the school engaged in initiatives to extend or enrich learning time? How does the school ensure that all students access these opportunities? Does the expanded time focus on broadening and deepening students’ knowledge and understanding of curricular topics and engagement in learning? Does the school partner with external organizations in implementing the plan? Evidence of a whole-school plan for increasing and improving learning time, including the amount of increased learning time and a description of how quality of learning has improved (e.g., a time audit, expanded learning time plan, or program description evaluation report); A list of partner organizations and their roles; Evidence that all student sub-groups have access to expanded time. Additional relevant documentation of specific programs, resources and approaches. Does the school design and use assessments of students’ work, knowledge and skills to help teachers understand how well their students are learning and to provide feedback that improves curriculum and teaching? Are assessments student centered, and do they provide prompt and useful feedback? Do teachers have the time and resources to use multiple forms of assessment to analyze student learning? Has the school resisted the current push to place standards-based accountability testing toward the center of teaching and learning and evaluation of its teachers? Evidence of assessments and description of teacher evaluation system. Evidence of collegial time spent on achieving these assessment-related goals, such as PLC or department notes, and relevant professional development materials. Does the school employ a variety of collegial and sustained professional development activities (e.g., mentoring relationships between new teachers and experienced teachers, high-quality teacher induction programs, professional development drawing on school-level expertise, professional learning communities, collaboration among teachers, and relationships between teacher teams and social service support providers that serve students and families)? Does professional learning promote instruction that is culturally relevant and develop a cadre of well-trained teachers who have a deep understanding of students’ strengths, needs, and diversity? Does the school support efforts to develop healthy and beneficial attitudes and beliefs among administrators, teachers, and school personnel (and students) regarding teaching, learning, and student capabilities? Documentation of professional development and mentoring activities for the 2016-17 year. Evidence of outcomes and/or products of PD. Relevant documentation of long-term professional development strategies. Does the school provide fully resourced programs designed to support students with special needs in the least restrictive learning environment? Is inclusion the norm, and does the school avoid inclusion classes that are low-track classes filled with high-needs learners? Does the school provide supports for all modifications and provide layers of support for students with special needs (from moderate to severe)? Are special education students actively engaged in the social life of the school? Does the school fully comply the word and spirit of the Child Find mandate while taking care to avoid inappropriate over-identification of low-income students, students of color, and English language learners. Documentation of the types of special education services provided within the school (e.g., pull-out, push-in, inclusion, self-contained classrooms), with the percentages of students (excluding out-of-district students) receiving each service over the total school population. Parent guides or other public materials describing the school’s approach to meeting the needs of students with disabilities. Research documents that students’ basic needs for things such as food, housing and stability impact their ability to learn. While students in low-income communities often have a greater need for these supports, including physical and mental health, they often have the least access to them. Does the school create partnerships to provide for unaddressed health issues such as physical and mental health, eye care, and dental care, as well as nutrition needs of the students and/or their families? Are families in need of housing, clothing or legal advice connected to service providers? Does the school understand and respond to additional basic needs? Does the school provide these services on campus? Are off-site physical and mental health dental, vision and nutrition providers easily accessible to students and families? Are there efforts to coordinate between academic and non-academic supports? Do families have adequate transportation to access the services? Please submit written descriptions provided to parents of the services provided, documenting how those descriptions are disseminated. Please delineate the staff or outside service providers (with contact information) who deliver the services or have a relationship with the school. Any other relevant documentation of specific programs, resources and approaches. The school’s curricular and pedagogical approaches should consciously and deliberately build on the interests, strengths and home cultures of the school’s students. When instructional practices and content are aligned with students’ experiences, they value students’ communities and engage them in learning. Culturally relevant (or “responsive”) pedagogy can be evidenced through literature, projects, assignments, events and field trips, ethnic studies courses, connections to families and communities, interventions and other resources. Further, these curricular experiences should be accompanied by supports for students and their teachers, to ensure that learners are challenged and successful at a high academic level. The course guide and 2016-2017 master schedule that lists course names and sections, provided along with Criterion #1, will document curricular offerings. Please highlight courses in that course guide that are relevant to Criterion #8. Please also included copies of syllabuses for applicable courses. Relevant documentation of specific programs, resources and approaches. Closing the opportunity gap for Language Minority (LM) students begins by approaching these students as emerging bilinguals and building on the language strengths they bring to school. Does the school start from this asset-based approach? Does the school employ effective strategies such as providing all teachers with professional development about the unique needs and strengths of LM students, implements strategies that provide students with access to multi or bilingual support as needed in core content classes, and including LM students in all aspects of the academic and social life of the school? Does the school support the LM students’ academic learning in all subject areas as they move toward fluency? Does the school communicate with language minority students and their families to ensure that student needs beyond language are met? Documentation of programs that build on first language strengths and that support students through the range of fluency levels. Descriptions of relevant professional development programs. Documentation of student access to qualified bi-lingual teachers. Samples of correspondence in parents’ first language(s). Evidence of how quickly and effectively student progress towards fluency while advancing in all academic areas. Descriptions of social services designed to support LM students. Engaging parents and communities in schools requires more than just good intentions and unidirectional communications. It takes planning, structures, and shared trust. Does this school have formal and informal policies and structures in place to engage parents and communities in school decisions about programs, curriculum or budgets? Do teachers and school staff receive professional development about how to work with diverse families and communities? Do parents feel welcome on campus to support their children and to help guide the school? Are parent and community meetings held at multiple times so working parents can attend? Are childcare and live translation provided during meetings, parent conferences and school events? Is there a translator on campus to support daily parent communication? Is there trust between the school and the larger community? Are there formalized partnerships with community organizations to bring additional resources and programs into the school? Evidence of the school’s commitment to parent and community engagement. Please provide documents that describe the different parent and community leadership organizations at your school, and the leadership roles and responsibilities of parents and communities in each one. Download the full selection criteria rubric as a PDF for reference.